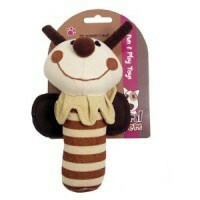 Natural Nippers Shake & Rattle Dog Toy is a specially designed toy for smaller dogs and puppies. Made from luxurious plush material, this exciting dog toy features a shake and rattle element to keep dogs stimulated and encourage play. Decorated with a funky face and pattern, your little pooch will enjoy hours of fun with this Natural Nipper. An excellent way for you to develop the bond between you and your pet! Toy measures 18cm in length.